Mushtak Khan 2 years, 5 months ago. Here we are presenting How to Enable Root on CM14/CyaongenMod 14 Nougat ROM on an android devices. CyanogenMod has in-built root access since CyanogenMod 12 (The Lollipop Vesrion) but that is disabled by default. The user need to enable root access on their phones manually as per their need. The CyanogenMod ROM comes has an inbuilt Super User manager since CyanogenMod 12 (The Lollipop Vesrion) which lets you enable or disable root access as per your need or selectively allow root access for either Apps only or ADB only or Apps/ADB both. You cannot see these settings unless you enable the Developer Options on your CyanogenMod ROM. You need not to worry because this process is really very simple and it will be like cake walk for you. I don’t know if you really know or not, CyanogenMod is the first most popular custom ROM for android devices which comes with no bloatware (un-necessary applications). Also the CyanogenMod ROM has many in-built added features unlike stock Android ROMs (AOSP ROMs). 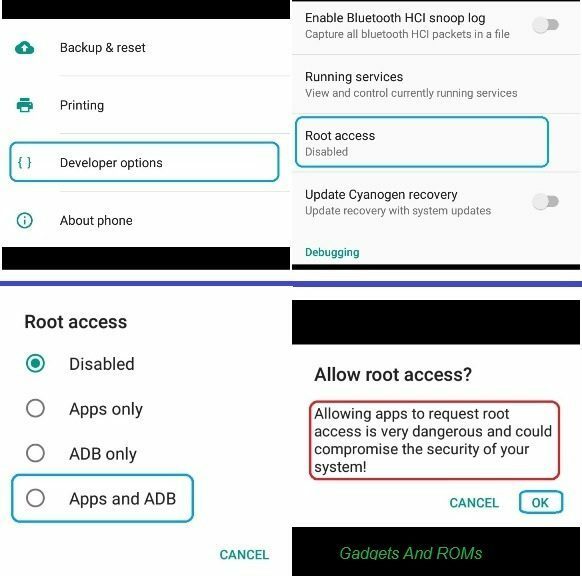 With the ROOT access on your Android phone you can further change some more settings on your phone, for example: You can tweak build.prop settings, you can customize your boot animation, you can manually change CPU frequency settings, you can add your own init.d boot scripts etc. There are many more to add on to this list. Simplifying the above statement, if you are a developer or an advanced user or very keen to learn all these things then yes you should enable the ROOT access. With the ROOT access a user can modify the system settings and this is the potential reason that the ROOT access is disabled by default. The ROOT access settings are actually provided under Developer options in CyanogenMod ROMs. Developer options are the same as comes in stock Android Devices. So, you need to Enable the developer option on your android device first. Now to enable ROOT access, open Developer options and then scroll a little bit down on the Developer Options settings and look for the Root access setting, which must be showing Disabled. Just click on the Root access and set it to Apps and ADB or Apps only or ADB only, as per your need. That’s all. Enjoy the benefits that comes with ROOT on your Android Phone powered by CyanogenMod 14 Nougat ROM. Stay tuned for more of such updates and if you like it then just don’t forget to subscribe. after this process adaway is not working..plz tell me how to get full root access..